History: 23/02/45: Sunk by torpedo from U-510 commanded by Alfred Eick, in the Atlantic, North West of Capetown (position 29.42S/09.58E) whilst sailing independently on a voyage from St John New Brunswick to Cape Town and Durban via Trinidad with general cargo. The Master, Captain Owen Owens and 19 crew landed at Mercury Island on 02/03/45 and taken by fishing boat to Luderitz, SW Africa. Twenty-nine crew were rescued by SAN trawler AFRICANA north of Spencer Bay on 04/04/45 and were landed at Walvis Bay, SW Africa. Nine crew were lost. Launched as Fort la Prairie (I). 26/06/55: Aground during typhoon, Yulan, Hainan Island (18.17N/109.33E). Total loss. 1946: Seaboard Queen, Seaboard Shipping Co. Ltd.
14/01/62: Collision and sank in shallow water at Constantza. Nom. Manager: Anglo-Canadian Shipping Co. Ltd.
1946: Lake Nipigon, Western Canada Steamship Co. Ltd.
1959: Scrapped at Nagasaki, Japan. 1968: Scrapped in Hong Kong. 1946: Harmac Alberni, Canadian transport Co.Ltd. 1946: Harmac Westminster, Canadian Transport Co., Ltd.
1950: Pelops, Cia Mar. Samsoc. Ltd., Panama/Hermes Steamship Agency Inc. San Francisco, Cal. 26/06/60: Pounded against pier in typhoon and sank at Tabaco, Luzon Island. 06/10/60: Further damage in typhoon. 1967: Scrapped at Split, Yugoslavia. 05/09/64: Aground during typhoon in Hong Kong. Back broken. Total loss. 1969: Scrapped at Spezia, Italy. 1968: Scrapped at Hirao, Japan. 1946: Waitomo, Canadian-Australasian Line Ltd. Launched as Fort Igance (I). Transfer to MOWT cancelled. 1970: Scrapped at Osaka, Japan. History: 07/10/45: Ashore. Wrecked at Magdalena Bay, California. 27/12/56 Disappeared at sea. Last reported 44N 38W (approx) West of Ushant. 15/03/63: Aground on River Douro Bar, Off Portugal. 16/03/63: Broke in two. Total loss. Launched as Fort Daer. Transfer to MOWT not completed. Launched as Fort Beauharnois (I). Transfer to MOWT not completed. Launched as Fort Miami (I). Transfer to MOWT not completed. Nom. Manager: Seaboard Shipping Co. Ltd. 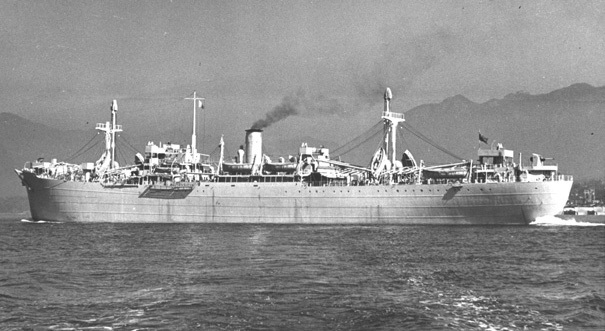 Launched as Fort Aspin (I). Transfer to MOWT not completed. 22/06/50: Ashore off Drew Bank, West Tobago (11.03N/60.55W). 25/06/50: Sank 11.04N/60.56W. Total Loss. 1973: Scrapped at Kaohsiung, Taiwan. 1960: Scrapped in Hong Kong. 02/03/44: Aground during fog off Flat Rock Point, 10 miles north of Los Angeles. 02/03/54: Refloated and towed to Los Angeles. Constructive total loss and scrapped at Terminal Island, California. NOTE: In a simultaneous switch of names, Yoho Park (I) became Fort Highfield (I) and Fort Highfield (II) became Yoho Park (II). Launched as Fort Highfield (II).